While the word two-faced has a negative connotation, we all have different faces that we show the world. Most people have a side that is shown to the public, and a side that is very much internal and might only be shared with someone truly special. The image that the INFJ reflects to the outside world is often quite different from the one they feel inside of themselves. Some INFJs do crave the chance to find someone who they can share their inside qualities with, someone who they can be completely open with. 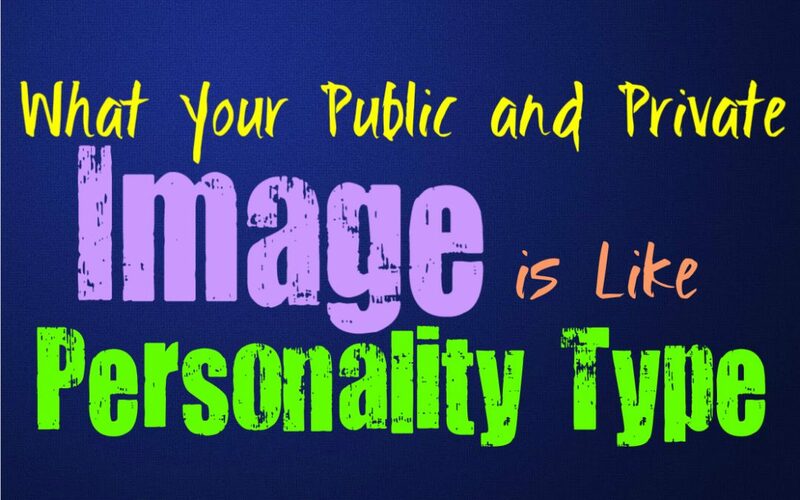 For the INFJ their public image is often a bit more polite and even reserved. They can appear quiet in certain settings, but social and chatty in others. It often depends on their environment and what is needed to make others feel more at ease. When the INFJ is alone there is honestly so much more going on inside of them that others don’t get to see. They are complex and thoughtful people, who are not quite as reserved as they appear on the outside. ENFJs certainly have a public image and a private one, but that doesn’t make either of them insincere. ENFJs are honest with others, but they aren’t always completely open. They don’t like sharing every bit of who they are with most people and can take a while before they feel comfortable truly opening up. When they are around others the ENFJ wants to portray a more perfect side of themselves, and so they can be afraid to show any cracks or imperfections. When they are alone though, the ENFJ can experience more doubts and fears than they allow others to ever see, unless it is someone they are sincerely connected to. INFPs don’t like portraying a different image to others, but they can be a bit more reserved around new people. They simply don’t like exposing their deeper parts of themselves, INFPs just don’t feel at ease around everyone, but that doesn’t mean they seek to portray a different image of themselves. They simply keep certain parts private, and wait until they trust someone to be completely open. The way the INFP behaves in front of others is always true to who they are though, since they dislike behaving differently for the sake of their image. ENFPs might act more outgoing around others, but most of the time they have the same image around everyone. They don’t like hiding who they are, and are naturally more open people. While they might not share their deepest darkest secrets with everyone, they don’t like portraying an image that isn’t sincerely who they are. ENFPs do amp up their charming side a bit, but this is often part of who they are even when they are around people they are close to. They want to be themselves and they don’t like pretending to be something for the sake of others. INTJs do sometimes have sides of themselves they show to certain people, but this is intentional. When they are in a business situation they will behave very cordially and firm, while they will behave differently around loved ones in a more social setting. For INTJs it is about doing what is logical and makes the most sense in that given situation. They believe in adapting in order to get things done the way they need to, and so their image around others is often different than what they feel inside, or what they show to someone they trust deeply. ENTJs do sometimes portray a different image to the public, versus how they are inside and what they show their loved ones. The ENTJ often shows themselves to be rather direct and strong-willed, and even a bit aggressive in accomplishing their goals. While this is how they behave around others, there might be a part of them that fears failure and letting down the people they love. This can be difficult for the ENTJ, especially since they don’t want people to see this more private part of themselves. INTPs are definitely different inside than they express to the public world around them. There are times when they might try to portray a certain image to the world, mostly to make things easier. They can be fearful of showing their true colors, since they can struggle to trust some people. For the INTP it is more about self-preservation than being insincere, since they don’t want to expose themselves only to be taken advantage of. What they show the outside world is often lacking most of their true inside feelings and thoughts. ENTPs definitely have a public and private image, since they can be fearful of exposing their more internal thoughts and feelings. While ENTPs might be outgoing and strong-willed around others, there is much more to them than that. Their more charming and social image is just one that they portray to the public world. Inside ENTPs can actually be romantics even more than they are cynics, they just aren’t ready to show this with everyone and so it often stays private. ISTJs do sometimes have a more public image, especially when they are at work. They do what they can to be adaptable and portray whatever image is the most efficient. For the ISTJ it is about being polite and doing what they can to fit into any given situation. Who they are at work or in the public eye is often very different from what they feel inside, or the image they show to their close loved ones. They might behave more serious or even more outgoing if that is what they need to show to get the job done. ESTJs are less likely to have a public and private image, unless they are in a work situation and need to adapt. When it comes to the workplace the ESTJ does whatever they need to in order to get things done as efficiently as possible. While they might adjust slightly for these situations, most of the time they behave the same in public as they do in private. While they might behave the same, this is often because they keep their emotions and inner thoughts to themselves most of the time. The more insecure qualities of the ESTJ are often kept quiet from everyone, since they fear being judged. ISFJs definitely have public and private images, since they want to do what they can to adapt to their surroundings. They work hard to take care of their loved ones, and want to make a life for them. For the ISFJ sometimes it is necessary to behave different in public, so that they can make others feel at ease with their behaviors. While their public image is often polite and extremely appropriate, the private side of the ISFJ can be much more playful and even a bit edgy. ESFJs definitely have a public and private image, and can even have more sides of themselves than just this. They will often only show certainly parts of their personality depending on who they are around, in order to adapt to their environment. ESFJs simply want to do whatever they can to comfort others and ensure that they are happy with them. It isn’t about being insincere, it is simply about holding back in certain ways so that they don’t upset anyone. In some cases it is about only sharing parts of themselves with the people they can truly trust. ISTPs do have a public and private image, but only because they keep most of themselves inside. They don’t like having to show all of their thoughts and feelings to those around them. ISTPs can be extremely internal people, especially when it comes to their deep emotions. They have a hard time processing their feelings and so being forced to share them with others just isn’t right for them. ISTPs are often sincere about who they are though, and so their public and private selves is just about not wanting to be as open with others. ESTPs can certainly have a public and private image, since they put on a bit of a show around others. Who they are inside isn’t always as confident and expressive as the person they show themselves to be in public. For the ESTP it is more about how they feel in the moment, and so they enjoy being someone who is charming and truly outgoing around others. While the ESTP can be quieter and even a bit reserved with their more private selves. ISFPs don’t usually have a public and private image, but they can behave a bit more shy around others. When they are in public settings the ISFP can feel a bit nervous expressing themselves, simply because they want to be too over the top. While they can keep parts of themselves quiet around strangers, they can be truly chatty and open around their loved ones. This isn’t done intentionally, it just takes time for them to feel more open and at ease. ESFPs are usually rather sincere about who they are, and so their public and private selves aren’t all that different. They are outgoing and social people, who can sometimes spend hours chatting with completely strangers about their lives. For the ESFP it is about being sincere and open, no matter what the occasion. They don’t like having to pretend and honestly being insincere is not something that comes naturally for the ESTP.